Just 1 and a half more weeks until we move to the short cast. Casey has been doing really good. I am sure she is excited to get them off, but she has not been to fussy with them on. It has finally cooled off so that helps a lot. Casey’s cranio therapist drew her a pumpkin for Halloween. If I could draw I would decorate them more, but I would ruin them. We started Vision therapy today. The therapist seems really nice. Today was more just questions and paper work. We will start the real therapy stuff next week. For now she will be going once a week. I really hope that this helps her track a little better and start to blink. 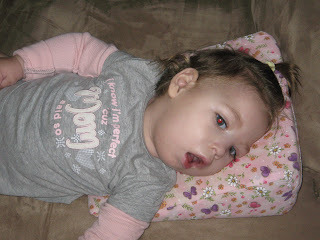 Casey has been working hard with all of her other therapies as well. She is getting a really good range of motion in her arms. She is also sitting up (with support) a little better. She is starting to make more noises lately too. She even tries to copy us if she can. Her latest thing is to try to make “L” sounds by sticking out her tongue. It’s very cute. One of her friends just turned 2 and we are going to his birthday party tomorrow. She loves parties. I am sure we will have a good time. We got a few checks in the mail this week from the Spa fundraiser that Molly G. organized in Austin. They did really great. Thanks again to everyone who participated in that. That’s about it for now. We hope everyone is doing well.